Computers are funny things. For some strange reason they seem to have a certain distaste for me. They like to die when they are in my possession. So once again, I am computerless. I have found one in Seoul for 200,000 won, and if it all goes well I will probably buy it. Still, my affection for computers is not great. They are my necessary foe. This past weekend I went to see “Jump,” which is a martial arts comedy about a Korean family. It demonstrated family dynamics and physical feats that were both interesting and awe inspiring. Then I went to a nearby park and looked at the amazing architecture of one of the kingdoms. I have lots of pictures, but it will take me a while to load them since my computer is out of commission. On Sunday I went with my church friends to Hard Rock Café Seoul and had a great time eating my chicken sandwich next to Billy Joel’s jacket. I also went to see the Dead Sea Scrolls at the Korea War Museum. I don’t know if you have ever had the chance to see them before, but it really makes your stomach flip flop to see these pieces of scroll that are hundreds, sometimes thousands of years old. They bear the stories of the Old Testament, and even more stunning, the book of Matthew. The story of my Jesus, as it was written down hundreds of years ago. And the story is the same today. It blows my mind. It was a wonderful experience. My friend Amanda has finally received her Visa number and is on her way to Korea!! She will be a welcomed addition to our group. And she lives very close, so we can hang out all of the time. This weekend is the RHEA conference. It is all about ministering to our neighbors up north. I am not attending because I did not register in time. But my prayers are with them as they get together with the focus of reaching souls. I ask that your prayers also accompany mine. Sorry postings have been so sporadic, culture shock and illness have kept me from fulfilling my promise to keep this thing updated. Now that I am settled, and have celebrated my three month anniversary, I am doing quite well. Thank you so much for all of your prayers!! Shamanism is still a pretty big deal in Korea. If you are unsure of what that includes, check out this article: Wikipedia Korean Shamanism As I rule I do not put too much confidence in getting my information from Wikipedia, but this is a very well laid out, easy to read description of it. Anyway, here are some videos of their mask dances that I thought were interesting. Shaman-ism was actually a culturally fading art until the female Shamans decided to take to the internet for clients. When their services became available more quickly and secretively, a sudden resurgence of adherent appeared. Now it is common to consult on of these woman before making any big decisions. The lady becomes "possessed" (their word) by a spirit that gives them the answer to a problem or the ability to heal a disease. Wow. That is scary stuff. Please pray for the people of Korea who allow this stronghold in their lives. Spirits and Shamans will not satisfy the inner desire to know their Creator. Only Jesus can do that. They need Jesus. As two buses full of sleepy eyed volunteers pulled onto the road that would lead us to Taean, I tried imagining what I would see. Because I live so close to Seoul, I had seen only large buildings and sharp landscapes. Even those observations occurred on the rare occasion that I was not underground in the subway. So I was very pleased to get to sit back and watch Korea float by my window. What I saw was the reason why Korea has been noted as the Land of the Morning Calm. After the cities with their big buildings and construction crews passed me by, I saw the bright greens of the mountains and fields. It was as if a wise old Korean gentleman had landscaped each mountain with his own hands, making sure each brilliantly colored tree was in just the right place. The patterns that were presented were nothing short of majestic. As we neared Taean, our eyes began to drink in one beautiful piece of scenery after another. There were perfectly set out fields of rice mixing elegantly with the unique rural architecture that could only be perfected in a place such as Korea. Everything looked planned, orchestrated by some highly intelligent mind to capture pure beauty at its most unrefined. The first glimpse of the vast ocean was absolutely breath-taking. There was blue as far as could be seen in either direction on the horizon. The sand glimmered in the sunlight, and the small waves on the beach seemed quite peaceful. It seemed to be the perfect place to reflect on life and love. As we drew closer, the landscape was interrupted by a group of people in white suits standing along back hoe trucks. It was at this moment that the true tragedy of what happened at Taean became a reality. On December 7, 2007 an unspeakable event occurred that challenged the beauty of some of the most awe-inspiring beaches in Korea. From Mallipo Beach to the Sinduri Dune, an oil spill threatened not only the natural beauty, but also the livelihood of an innumerable amount of locals. But it is said that it is in the darkest times of ones life that they get to see the most brilliant of miracles. It is in Taean that such a miracle occurred. In response to the overwhelming tragedy, hundreds of people began volunteering to help clean up the spill. The spill had spread faster than had been hoped, and immediate action was required. The members of the community as well as people from all over Korea and the world saw their responsibility to help out a community in need. And as the time went on, more and more people responded. It has been said that over a million volunteers have walked on those beaches, cleaning up the oil spill with the sweat of their brows and the strength of their backs. After arriving and receiving instructions, I set to work applying all of my protective gear. I was soon very thankful that it was not a very hot day. I trudged my plastic outfit and rubber boots down to a small cove in Baekripo Beach. I was given a bag of dry rags and a commission to clean oil covered rocks. As I walked, I noted in my head that everything looked pretty good. After some fancy footwork on the rocks, I sat down on a ledge and began scrubbing. There was nothing on my cloth. I was wondering if there was much for me to do. Then someone approached me with three large rocks covered in what could only be black sticky oil. I began cleaning the rocks, and realized how much work must have gone into bringing the beach to the point that it was at now. After cleaning the rocks, I was led to even more rocks that were covered in this forsaken goo. It is amazing to feel as if you are part of a larger picture. I felt as if I was taking part in the miracle that occurred in Taean. Later in the day I had the chance to use special sponge-like material to soak oil out of the water on another part of the beach. There were a large number of men and women in white suits working with us. It is thankless, monotonous work, but it is necessary to ensure that the oil is thoroughly cleaned from the beach. And little by little, this effort has accumulated. As summer approaches, the beaches are looking great. There is still much work to be done, and more volunteers are needed. But what the people of Taean need more than our helping hands is for tourists to visit these beautiful beaches. A great deal of revenue from the area comes from tourism. Some people may think that because of this disaster the Yellow Sea beaches may not be suitable for visitors. Let me assure you, I have seen the miracle of Taean with my own eyes, and I invite you to come see it for yourself. Walking to work today, I finally got to get a glimpse of this Yellow Enemy that has been giving my lungs and sinuses trouble. It was all over the sidewalk, and blowing through the air, like a huge dust storm. There was a short time walking home that I was squinting my eyes to keep sand from cutting them up. Not cool. I will make sure to get a picture, it is really really yellow. It is not beige or tan. It is bright yellow sand that flies through the air from the Gobi Desert. Now I get to walk to dirt from places I have never been!! Haha. This weekend was full of relaxing. As you may have noticed, I have been constantly moving since I arrived over two months ago. So this weekend, I crashed. I cleaned my apartment, and relaxed. On Monday I got to visit the magical land of Cosco with Pastor Dwayne and Gayle. It was amazing. Amber kept taking pictures of everything, so I am sure I can find one to post to let you see how wonderful it really was. It was the first time I have gone shopping here that did not require me to stop breathing through my nose. It actually smelled like a grocery store!! I bought some chicken, salad, and MAC AND CHEESE!!! I was a happy camper. And I got a book for my kids called "Tickle the Duck." It is really really cute. I read it to them today, they loved it!! I am pleased to say that this week I will be mailing my very first check to my school loan company in the amount of 1,000,000 won. Which is roughly $1,000!!!!! Yay! Progress is a good thing. And it looks like everything is going to work out as planned. God is so good. I have been reading a book called "Far as the Curse is Found." It has been really making me think a lot about how hard God tries to reveal Himself as the God who is knowable. How amazing it is that the not only wants us to be saved, but that the he goes beyond that and wants to be the knowable Savior. Wow. I finally added my mailing address to the site. You're welcome, Mom. Two months in Korea! So hard to believe. Amanda will be here next month, which will bring our little group up to four. Good times. Sunday after church, we all went out to lunch in Gangnam. (gang-nahm) Afterwards I went to get some ice cream with half the group because my mouth is no longer used to eating jalepenos. Jen and Amber went with the other group, who went to the book store to find something good to read. After getting my treat, I was sitting on the outside platform when two riot police buses pulled up and dozens of policemen ran off onto the street. The Korean girl with us said that it was probably a riot. There are lots of riots here, but I have never been involved in one. So we sat, trying to see what was going on. It looked like all of the Protestors were there in support of the Olympics in China. If you are not aware of the political stress behind it, I will include some links. China is focibly repatriating North Korean Defectors who get out of the country looking for freedom. When they are sent back to North Korea, they are killed. China has even got to the point of paying people to turn them in. Amidst all of this, South Korea is not happy. And if all of this was not heartbreaking enough, the North Koreans were forced to wave Chinese flags as the torch made its way through that country. What mental damage is done to people made to celebrate the very ones that who are destroying their only means of escape from this severely misguided leader! It makes your heart heavy to consider all of the things transpiring. We have, to my knowledge, been cleared of Bird Flu risk, which means I can eat chicken again!! Yey!! Oh the joys, tears, and adventures of Korea! An embarassing amount of time has passed since my last update. I apologize. Everything has been going just fine, and busy as always. Last weekend I went with my two closest friends to the 63 Building, which is the tallest building in Seoul. At the top there is a Sea World, an interactive sky deck, and an IMAX. We got to go to all three for only 22,000 Won. Which is about 25 dollars. This was my celebration of God healing my body. Every year around this time I take a day and do things that make me feel the most alive. So we took a bus, not quite sure where exactly we would end up. Then we took a walk along the BEAUTIFUL Han River. It was a perfect day. Sunday at church the missionaries told us the story of how God called them to work in Korea. At the end of a very emotional tale, they told us that the AG was planning on using our church as a launching place for ministry to our neighbors! It was crazy because God has been very obvious that he wants us to be involved in that ministry in some capasity. Obviously, I am going to remain faithful to my responsibilities here. But it is wonderful to see how God works in your life when you give him complete control. Yesterday, I went to a Hillsong worship service in Seoul. I must admit, at first it was strange, because I was so used to hearing Darlene's voice on CD's, that it sounded kinda fake to hear it in person. But God's presence was there in a powerful way, and I am thankful that I overcame my exhaustion and braved the subway to go. They showed a video of babies in Africa, and of course I cried my eyes out. I feel like I have an emotional dicotomy torn between what God has called me to now, and what God has called me to do in the future. I desire to be with the children of Africa, giving them the hope and love that only comes from Christ. At the same time, God has made it clear that Korea is my place for now, and there is a whole country filled with suffering people who need love and hope. Simply put, I desire to be obedient to God. That journey may take me to places I have never considered, but God has already planned it for me, so all I have to do is follow his voice. I am meeting with Tim Peters tomorrow about Helping Hands Ministries. I will give you an update within the next couple of days. Blessings! I long for the moments when God makes you feel as if you are right where you should be. Last week, I did not feel that way at all. I have been sick with a sinus infection for a couple of weeks, and it finally got to the point where I didn't know if it was going to go away, so I went to the doctor. The thing that made that exercise feel like failure is that I made Jen and me miss our meeting with Tim from Helping Hands. This is the ministry that goes into the place farther from the equator and reaches actual people with actual needs. So I was a bit disappointed, as I have made clear over a couple of posts. But today...God. My breath left my body, my mind reeled at the chance...God. I was not feeling particularly well this morning, as I had spent most of Saturday in bed rather than going to Everland, which is baiscally Disney in Korea. The fact that I missed out on such a thing is proof positive of my illness. So this morning I debated on whether I should get up and make the hour and a half journey to church. But I did, and I was actually excited about getting there early. The pastor introduced a group of visiting people, and when he did, my jaw hit the ground. Among the mysterious visitors was the very man that we had been speaking to regarding ministry!! He was there, in our small little church!! I couldn't believe it! The chances of him ending up in that congregation on the Sunday after my so-called defeat was...God. Yes. Korea. This is where God has wants me. Yes, indeed. I had to stay home from work today because my mysterious six pill combo apparently contains artificial sweeteners. There was no way to tell because they are not from the US, therefore, they were not found by the pill recognition program online. And the name of the meds are in Korean. So I am clueless as to what I have been taking. I do know one thing though, I am dizzy and sick to my stomach. I have hives on my face and hands that are itching horrible. I almost wish I would have just dealt with the sinus infection, because this actually makes me feel more sick. I hate being sick. Everyone does. I wish I were like Smith Wigglesworth, I wish I had such faith that I could denounce every sniffle as a ploy from Hell. Maybe I should. I know that God does not want us to suffer. I know that Jesus' death provided a way for our healing. What makes cancer more worthy of prayer than my sinus infection? It is because we can fix one but remain baffled at the other? I say that God wants to heal all disease, not just hard ones. He does not only want to heal people so that they can stand back and be amazed. He heals because he cares for us and does not want us to be in pain. We should be shouting and praising God every time he takes away a headache, or a runny nose. What a miracle! Something that is so intensely real one moment, gone after just a moment of prayer. I am quickly approaching my third anniversary. It has been three years since I heard a medical professional tell me that my life would end. Three years since I was given the "there is nothing we can do for you here" speech. Three years since I had to tell my family that going to a place they did not want me to go to had caused me to contract a disease that would take my life. Three years. It seems like such a long time, and yet my breath is still stolen away when I remember those lonely nights spent weeping before God to let me live. Wondering what Jesus was going to look like. Wondering how I was going to be able to look him in the face after I had only led a few people to Christ. I had childhood dreams of telling the nations, and there, on that cheap, overused dorm bed, I lay trying to figure out in my mind how I was going to explain my unsaved high school friends. How I was going to leave this planet with my father still lost. I knew that God was sovereign, so my death would not be unjust. When Maggie went with me to the doctor to get blood taken for final tests, I was so sad. She, being the good friend that she was, did not act upset, but supportive and hopeful. I did not want to be around people during that time. I wanted to spend my time with God. And besides, people proved to be more exhausting than I could handle. I had to spend most of my time with them comforting and reassuring. But then the call came. He didn't say much, and that was because I had an appointment with him later that week. We were going to lay out a course of action. I was going to go home to Maryland, and be admitted to Johns Hopkins for treatment that would possibly extend my life six months. But as the doctor told me that none of the tests came back positive for Hepatitis and they found that no trace of other maladies, I knew God was up to something. He did not tell me that I was all better. He did not tell me that it was gone. But something in my heart told me that the fact that there was no malaria in my blood meant that God was working on something. So I had a Smith Wigglesworth moment. I told the person who was with me that God had healed me. My blood was clean. I went to the campus pastor and told him that I had been healed. I still had welts and the pain, and the strange feeling that my insides were coming undone, but I knew that God was working. Within three days of this incident, the day of my return doctor's visit, I stayed home. I had no more welts, I had no pain, and I was in the middle of final exams. God had come through for me. Not only me, but for all the people who had prayed for me. And as I walked the Bible down the isle at graduation, I turned around to see a sea of faces looking at me, a miracle of God, one called to present the Gospel, and I knew in my heart that those dreams of reaching the nations were not childish wishes, they were to be my life. The life and times of a crazy women living in Korea. That is what I should have named this site. Anyway, I have been having a bit of adventure the past few days. I spent Saturday night with Amber in Anyang, and we all went to Dr. Fish. That is the name of these little not-much-bigger-than-a-goldfish things that eat the skin off of your feet. Theoretically, they eat only the dead skin. But they do caution you to not leave them in there longer than fifteen minutes, so I am not so sure as to how safe it would be to assume they nibble off only what you do not need. It was actually very hard for me to do it. Amber thought it was a breeze, and Jen's only concern was that it tickled. I was worried because every time I put my toe near the water, they all swam to the top and began opening their little mouths. It was like a little fishy chorus right there, waiting to eat my foot. So I was the last one in. Yes. And I am not ashamed. I thought the thing through. How much damage would be done if, for some reason, they had accidentally added a parranah by mistake. Could I walk home in that condition? Because most of my time is spent walking here or there, so I really need my feet to be alright. I eventually got over my crazy fear of these flesh eating fish, took a deep breathe, and put my feet in. Was I worried? Oh yeah. But after about two minutes I had decided to not think about what was happening. It felt like a bubbly foot spa, and that is what I convinced myself to think. Yesterday I had to go to the Doctor's because I had a horrible sore throat and a sinus infection. The man thought he was funny, poking me as hard as he could in the forehead and then telling me to not be so sensitive. Then he put these plier things up my nose and pried them open. Not sure what that helped, but at least I avoided the fate of my colleagues. I had no needle stuck into my read end. so I count it all as a victory. Finally, he stopped experimenting after he sprayed this Bad-Breathe smelling junk down my throat and caused me to get sick. I guess that is what he was shooting for, because after that he gave me a prescription and sent me home. I am feeling much better now. I have to take six pills every few hours, and I have no idea what they are, but it seems to be helping. It only cost roughly twenty five dollars for the visit and the meds, so it was not that bad of a set up. I knew that I was going to keep getting more sick if I did not go soon though. I have a class full of babies who have never left their homes until this year. They are all sick constantly. Do they teach them to cover their mouths? No. Do they teach them to blow their noses into a tissue? No. They blow their nose alright, but then I have to run at them with a tissue before they are covered in germ infested goo. One girl has actually been vomiting for a couple weeks now. They finally took her to the hospital and she was back in school the next day. I was like "What??" And so I am sick. My little angels are making me sick. But I waited until yesterday to go because today is election day and I get to stay home and relax. For the rest of the week, I am taking a vowel to eat only Korean food. I will let you know how it works out. Oh, yeah. Amanda will be joining us very soon. So please pray for her arrival and that the job that she wants is the one that she ends up with. Next week Jen and I will be making contact with the leader of the ministry group that we are going to be working with. I do not know how much information to disclose at this time about this group, but please pray that everything goes well. I was thinking today of how incredibly close I am to the most wicked place on earth. The South gets threats all of the time, which they deem annoyances as the North is only wanting more food. The hunger, the human rights violations, the fact that these people, created in God's image, are living as lower than animals. My stomach turns as the stories. Starvation to the point of Cannibalism, mind washing so intense that the people do not even know they are suffering...these things should not still be happening in our world. They seem so primitive and ancient. The people who are starving not only for food, but for hope and love. They need to know that they matter. That someone cares about them, and that God cares about them. I can not wait until the day that the boarders open up. I will stop what I am doing, run as fast as I can over that forsaken boarder, find the first child I come to, pick them up in my arms, look at them with a teary smile, and announce to them with as many Korean words as I know, that I love them and that Jesus loves them. Then I will run on and on from child to child until the whole country knows the love of Christ. Great men have dreams, but Church, we have a destiny. Update coming soon, in the meantime, check out new pictures! Let me introduce you to one of Korea's many technological advances. 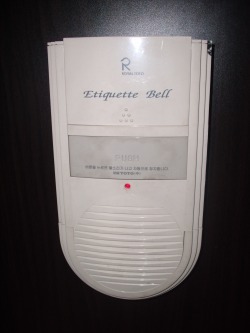 It is the Etiquette Bell. It's function? To drowned out embarrassing bathroom sounds. No, really, it is. You simply push the button, and you will become overtaken with a symphony of flushing and running water. There is also a volume control. I have decided not to further detail the possible uses of such a thing. Just take it for what is it, and count the days until the US finally catches up with this wonderful piece of technology. One of my kids decided that he was going to scream as loud as he could every time he was put in time out for speaking Korean. Over and over again. So I took him to the Principal's office, which of course scared the life out of him. She talked to him, and from that point on he was not fond of me at all. But he was disrupting the other kids, and because I happen to be the adult, I had to do something. It felt extreme, but I guess it was an extreme case. The kid screams when he is not happy. Good times. The rest of the day went well. We made monkey masks to go with the letter of the day, "M." We talked about the weather, and it was all smiles. Until the end of the day. When one of my girls started holding her throat and crying. That is when it stinks to not speak Korean. I had no idea what was wrong. So I picked her up, and she was crying really hard. The Korean helper came in, perfect timing, so I handed over the sobbing toddler just in time for her to vomit all over the room. And I do mean all over. So my elementary class had to meet in the playroom. The kids are already pretty active, so it was overly stressful to try to keep them focused without a blackboard and in a room full of toys. So we returned to the vomitorium. I opened all the windows and we were fine. It smelled like kimchi. When food is eaten, it is supposed to smell differently when it, through an unnatural act of nature, comes back up. But no. It was definitely kimchi. I got a new boy in my class who is very much a class clown and likes to act out. He has that cool blonde dyed spot in his bangs. He thinks he is cool. After my day, I was in no mood to humor him. So I was all business during the class. We reviewed verbs and did A LOT of word problems. For some reason when numbers become words, math becomes impossible to them. So I am trying to help them overcome their fear of word problems. Another day. I feel that Korea is turning out to be a stripping process. Here I am not the smart girl, I am not the funny girl, I am not the creative girl. I am just me. Jesus and I are reforming how I see myself, and how I identify myself. It is not an entirely fun process, but a necessary one indeed. ....while I am waiting, yielded and still. I updated my pictures!! Have a lookie. They are a little random, but every time I see something I think that you would like to see, I take the picture. I want to get more pictures of the interesting things people do here, but it hard to get a picture without getting nasty looks. There are tons of really neat sculptures here, so I am going to start a link with just pictures of all of the arty things. I have officially been in Korea for a month! It is hard to believe. The time has gone so quickly despite trying to get the hang of life in Korea. I really do like it here. I would recommend it to anyone. I think my struggle was that I was trying to compare it to Malawi. There is, in no way, a comparison. Once I figured that out, I was fine. I am going to learn the Korean letters this week so that I can get around easier. Most of the time, things are in English, with Korean Letters. So if you know the sounds, it is just a matter of phonics. It is kinda like those puzzles where you have to replace the triangle with the letter g, the square with the letter r, and so on. Each squiggly is a different sound. I spent the entire weekend at the missionaries' house, having a great time with some fellow English Teachers. It is refreshing to be around new Christians. We had to say goodbye to a young man who had been asking so many questions. There was a little suspense in the air, because everyone wanted him to make a decision for Christ before he left, but I suppose he is in Christ's able hands now. Please pray that the Holy Spirit will stay with him, and that he will find Christ. Next Wednesday is an unexpected vacation day! It is the local elections, which means that everything will be closed, but I will be able to stay home and catch up on some cleaning. Things get so dusty here! It is kinda gross. You clean the floor, and two days later, there are these massive dust balls everywhere. Yuck. But what can you do? When the sand comes, it will be worse, so it is only beginning. Make sure to check out the pictures!! Today I realized that my site was getting too big for my layout. So here is the new one, I hope that you will enjoy it just as much. Today was fun. In school, I have managed to teach my kids quite a bit of English, which is impressive seeing that there are only 3 and 4 year olds. I did find out that they probably have no idea what I mean when I say "No Korean, you have to speak English." That is because they do not call their country Korea, they call it Hun-something or other. I will ask again when my director is not in the middle of eating. But it really DOES work.I am just as surprised as you! After work, I had some kimchi kim, which, as far as I can tell, is kimchi boiled in a stew with pork and lots and lots of chili pepper. It was actually very good. I had some boiled peanuts in soy sauce, and a salad of onions and peppers. With chili pepper sauce. My face was hurting from eating all of the spice. Then we had pork that we grilled on our table wrapped in a romaine lettace leaf with chili *surprise* paste, a seaseme leaf, and a clove of raw garlic. That was actually the best part. Minus the fact that you had to shove the whole contraption into your mouth at once. The only downfall to the meal is when I almost threw my cookies over "cold noodles." It is this angel hair pasta texture cold noodle in vinegery sauce. The only thing that caught my brain is that it was gray, so it looked like a big bowl of cooked worms served cold. That didn't go so well with the stomach. So I quickly ate more chili sauce and my previous problem had returned, overshadowing the worm noodles. After talking to the directors over dinner tonight, I am feeling better about my class. I always have worries that somehow I am not finding the right balance between fun bonding time and hard work time. But I suppose that as long as the kids are learning what they need to learn, the rest of the time is better spent playing games than trying to get them to sit down and practice one more handwriting sheet. Tomorrow I am meeting my church group at the missionary's house for an afternoon of fun. We are going to have a Bible study and talk about Jesus. I love talking about Jesus. I am so sad that I took those moments for granted. A young girl today wrote her journal entry on how she went with her family to their grandparent's grave and bowed down on the ground to them. Then they went to a Buddist temple where the air was fresh and they could be in good health. It breaks my heart. I just want to tell them that Jesus is the Way. He is the only one worthy to be bowed to, He is the Healer, He is real. But I pull myself from this story, which served as my heartbreaking wake up that my students are lost without Christ. There are only two of them that go to any kind of church. Unfortunately, they are the whinny undisciplined kids, so that doesn't help much either. I love these children a little more everyday, and with everyday comes continually growing pain in my heart to know that I may be their only connection with Christ. What a great task! What a heartbreak! But what a Hope we have! That Christ will forgive the sins of a multitude of people, and at the same time, enter the fragile hearts of my young children.